Protesters, headed up by workers’ rights group Labour Behind the Label, were calling on the brand to ban ‘sandblasting’ in its supply chain â€“ a technique used to give denim a worn and faded effect. The practice involved firing high pressure sand at jeans, which creates a fine Silica dust that gathers in the lung, eventually causing a fatal lung disease. Many workers are known to have died as a result of the practice. Luxury fashion brands Versace and Gucci are among those to have already issued a public ban on the practice. 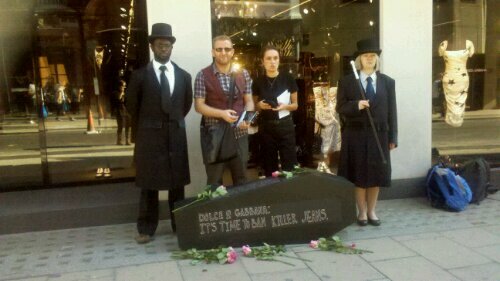 Yet Dolce & Gabanna explicitly informed campaigners from the Clean Clothes Campaign that it has no interest in banning the practice, despite conclusive evidence and numerous deaths demonstrating how dangerous the practice is. Also present at the protest was Abdulhalim Demir, a former Turkish Sandblasting worker and father of 3 said. â€œAll the workers who worked in this profession are sick now,â€ he said. My illness has progressed to 46 percent of my lungs. I canâ€™t do physical work, I canâ€™t run or climb. If I catch a cold, it is very dangerous for me. I am short of breath all the time and I canâ€™t talk. In many cases I have to go to hospital for a month and get direct oxygen. 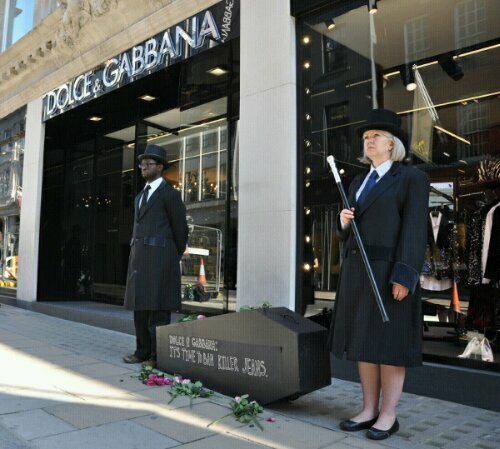 “It is outrageous that reputable brands such as Dolce & Gabanna continue to ignore the dangers presented to workers and refuse to ban this deadly practice,â€ said Anna McMullen from Labour Behind the Label. Killer fashion doesn’t have to cost lives.